Note/nota: these poems are subject to change at any moment. They are not final versions. Estos poemas podrían sufrir cambios en cualquier momento. No son versiones finales. 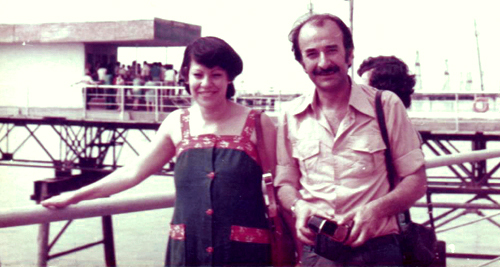 With my wife Ana Mercedes Rodríguez Acevedo during a visit to the oil fields at the Caspian Sea coast of Baku, Azerbaijan, August 1977. The photo was made while traveling with a group of students. We were still studying in Germany. Merce had recently obtained her Master degree in psychology and I was working on my doctoral thesis in journalism. We first flied to Moscow, then to Yerevan, Armenia. From there we went to Baku, Azerbaijan. On the way back, we spent few days in Kiev, Ukraine, before returning to Germany by train. It was in Yereven (few days before this photo was made) that we came to know each other. Since then, our lives have been bound together in a close, productive and continuous relation. With the passing of years, the love that came into being on one memorable evening in Yerevan, has become broader, tenderer and more intensive. Merce and I are aware of this blessing. Our children, family, our academic, professional and personal development, our contribution to culture and society have always been at the center of our interests. We have always worked hard, overcoming obstacles and enduring hardships, particulary during our years of wandering between countries and continents. Learning, producing and helping others have always been determining features of our life style. They taught us how to become sharing persons, good and respectful of others, in and outside our family. Our concern for others has always been our main driving force and source of energy. By helping others and enriching their lives in the broader social and cultural sense, we have been able to enrich our own lives.